Which design is the best for you? Default, Food, Fashion or Baby design? Typography settings: set any Google font by just selecting it from a dropdown. On-click setting. Demo importer: Import any demo with just one click! One click provides entire demo look: styling, content, menu, widgets, Theme Options, landing page, .. Default design is made for any kind of news to write. It is original and also you get PSD for this design. It has a lot of features, like different headers, home layouts, category views, pages and most important you can create every post different and unique. Please check it. Food design is made for any kind of news about Food to write. You can write your own recipes and have your own blog about food. Or you can create multi-user authors blog and other people will write recipes for you. You can do bunch of stuff with this design. And you can create unique, different look. Are you a fashion blogger or are you interested in fashion clothes, perfumes, make up or just something? Then this design is perfect for you. 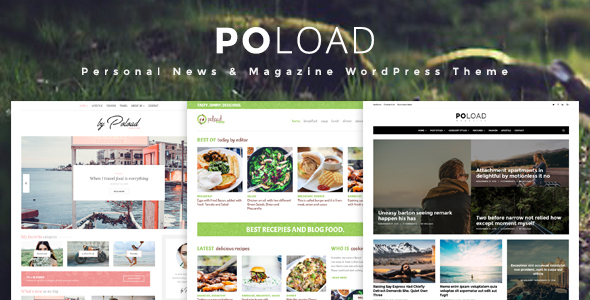 Create your own unique and stylish website with Poload Fashion Theme..
Are you a caring mother and want to share your mother experience online? Then the Poload Bbay layout is just right for you. Create your own unique website and post your articles..